This Tuesday morning finds me enjoying my comfy chair in the corner of the family room once more, coffee in hand! Yesterday morning was not only early, but topsy-turvy as we got Emma off to XFuge Mission Camp at 5 am! If you know me at all, you know that I don't do 5 am very well. I was very grateful to give up those early mornings when I left the Police Department years ago. I was even sharing with some friends at Convention that I have my little morning routine to help me ease into my day! Hmm...what's even funnier is that these days, I'm not much of a night owl either! Does that mean I'm getting old? Wow, I hope not because I sure still think like I'm in my 30's! So, I'm kind of planning my day today - it does include some stamping - Yay!, but I'll also be back later with some more photos from Convention for you. AND probably tomorrow, I'll have that photo tutorial up for you of the Pinwheel Candy Sticks. Sound good? Ok! Now, how about a card? I designed this card within an HOUR of getting my new box o' Stampin' Up! goodies and I loved it so much, that not only did my card classes get to make this beauty, I did another version in Marina Mist for Convention Swaps! Did you get one? Do you like it? I hope so! Anyway, I used Regal Rose Classic Ink for all the stamping. Once I had the flowers stamped, I ran the piece through my Big Shot with the NEW Stripes Textured Impressions Embossing Folder. Love me some Embossing Folders!! 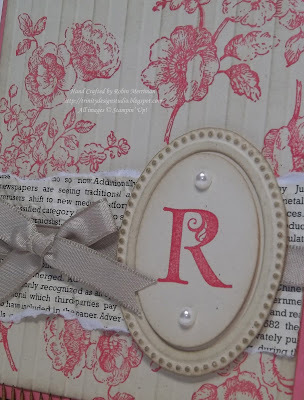 This one is fantastic and I love how it makes this stamped cardstock look like vintage wallpaper! 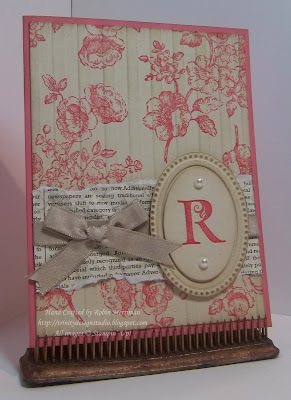 I used my Stamping Sponge and rubbed a bit of Crumb Cake Classic Ink on all the cardstock and paper to further emphasize the vintage feel. The Designer Paper is from the First Edition Specialty pack. I cut 2 1/2" x 4" pieces and tore off the top and bottom. They were crumpled up and rubbed with Crumb Cake Classic Ink. I added the Crumb Cake Taffeta ribbon wrap and attached the bow with Mini Glue Dots. Now, let's get to that FRAME!! 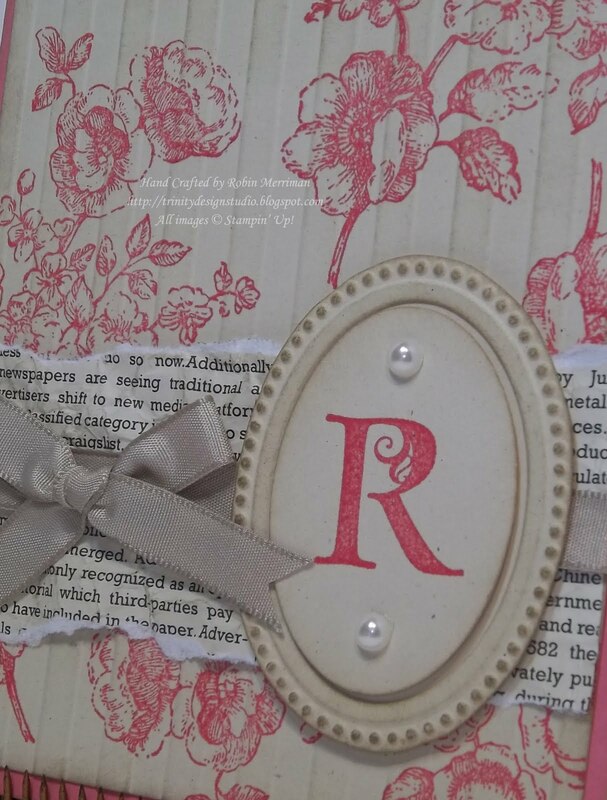 This was made with another NEW Textured Impressions Embossing Folder! The Designer Frames SET of TWO comes with an oval shape and a rectangle shape - both are fabulous! After running my cardstock through the Big Shot with the oval shape, I simply trimmed it out with my Paper Snips. The monogram was stamped on another piece of Naturals Ivory using the Lovely Letters Stamp Set. I punched it out with the Extra Large Oval Punch. Both layers were popped up on Stampin' Dimensionals after being aged with some sponging, and I added the two Basic Pearls as a final touch. I wish I had taken a photo of the Marina Mist version - I didn't even keep my sample! If you got one by swapping with me, maybe you could take a picture and e-mail it to me! But for those of you trying to visualize it, just replace all the Regal Rose with Marina Mist and that was it. As usual, I've included a complete supply list for you so you can do some shopping for your supplies. Just visit my Online Store with this list and you'll be on your way to making your own cards! Click on the SHOP NOW button at the top right! Fabulous! Gorgeous! Congrats on all your awards at convention. And, how did I not know we had that frame in an embossing folder?! Beautiful card! That stamp set is one of my favorites! I may demo this card at my next workshop. I am really going to have to case this one! Lovely card! I had my doubts about both of these embossing folders. Thanks for the wonderful sample for both of them. I received your Marina Mist swap at convention and it is gorgeous! I will try to send you a picture of it if you still want one!